We joined a CSA recently! For a vegetable-obsessed girl like me, this is big news. So much so that I want to tell everyone I interact with…but that would be a bit weird, so I’ll just tell you. I’m already anxious for June to roll around– for that first box to arrive, full of vegetables grown for my family by people that I know. To be honest, we haven’t been CSA members for a couple of years now. I know, I know. You see, the previous CSA that we belonged to didn’t quite meet my family’s needs. We ended up spending a ton of money every week to supplement the offering. This year we dove back in, and decided to go with Bossy Acres. The fabulous ladies that run this CSA are heavily involved in the Twin Cities food community. I had heard remarkable things about their CSA from several friends. And then, once I had a chance to talk with the owners about the excitement and passion that they put into their work, it made me realize that I wanted my family to be part of it. And I am so darn excited! Did I already mention that? Alright, now that I’m done with my mini celebration it’s on to today’s post. Even though this is THE NEVER-ENDING WINTER here in Minnesota, I’ve moved on to think about lighter, quicker fare. Spring has to arrive eventually, right? It’s just a matter of time before the farmers’ markets are loaded with fresh vegetables, and I’ll also be getting my first CSA delivery. Waiting is hard. I want strawberries and tomatoes now. 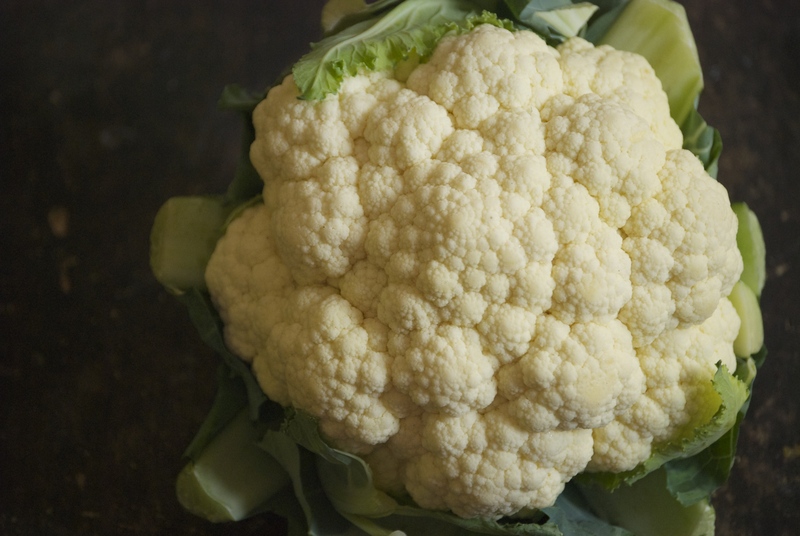 But until then, I’ll enjoy this gorgeous cauliflower. I love how hearty cauliflower is. It’s reliable and always a good option in the Summer or Winter. Out-of-season tomatoes and cucumbers can’t claim that. 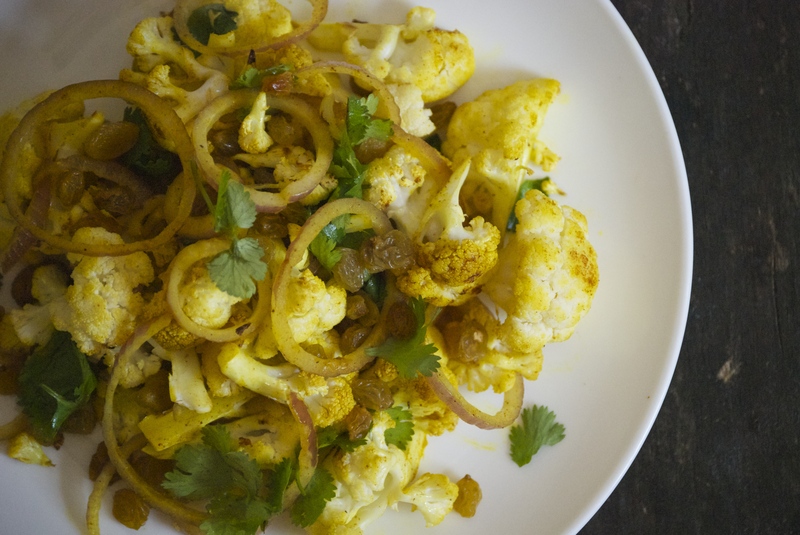 I enjoy this side dish (though I eat it as a main course) when the cauliflower is roasted just a bit. Not entirely soft, but not raw either. Once it’s done, I like to toss it immediately with red onion and golden raisins on the hot roasting pan. It warms them through and takes the edge off the onion. Infusing the spices in warmed olive oil is a great way to maximize the flavor. This is a subtle dish. It’s not swimming in a sauce or loaded with flavors that punch you in the face. And it comes together in a matter of minutes. The golden raisins are key– the slight sweetness that they add is crucial here. Hope you enjoy! Preheat an oven to 400°F. 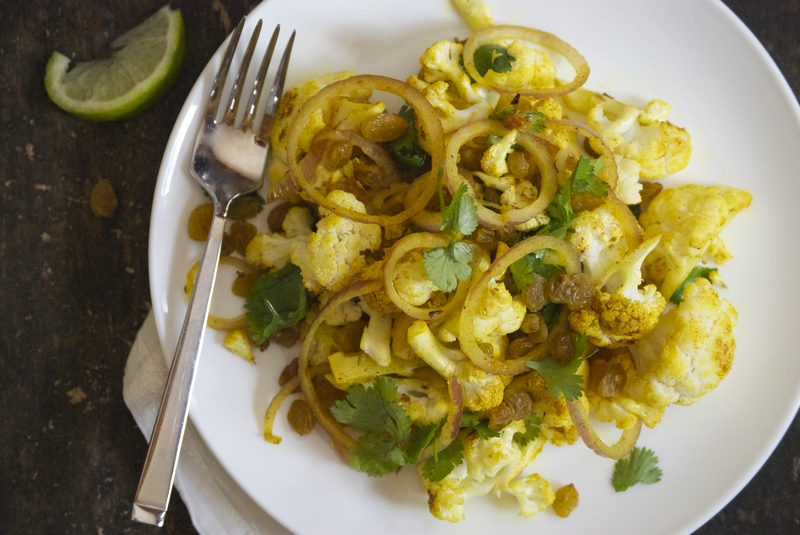 Toss the cauliflower pieces with a drizzle of olive oil and place on a baking sheet. Roast for 15-20 minutes, or until the cauliflower has browned slightly but isn’t completely soft. 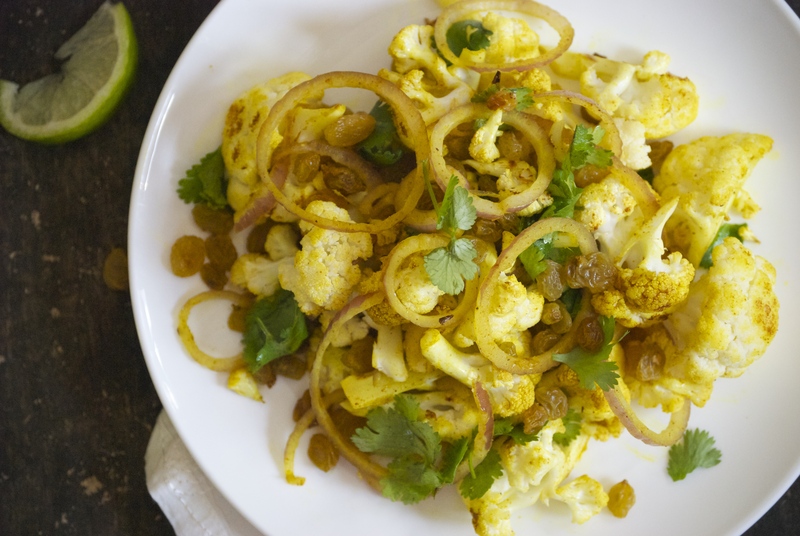 Remove from oven and immediately toss the sliced red onion and golden raisins on the hot pan with the cauliflower. Meanwhile, prepare the curry-scented olive oil by placing 2 tablespoons of olive into a small skillet. 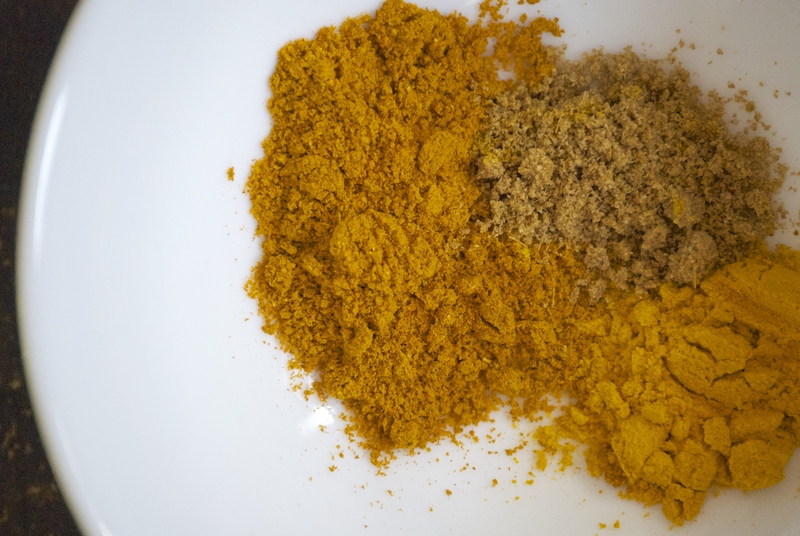 Mix the curry powder, turmeric, and cumin into the oil and heat on medium for about 1-2 minutes, or until the oil becomes warm and fragrant. Make sure to stir it. Remove from heat and pour over the vegetables. Toss with cilantro. Season with salt, if necessary. Serve with a squeeze of lime. Enjoy!